The School celebrated Independence day on 11th August 2017 with lot of patriotic zeal . A special assembly was conducted by Classes VII A & B on the occasion . 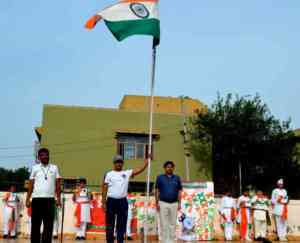 The tricolor was unfurled by the School Principal, Mr. Bhagat Singh and the National Anthem was sung. The Head Boy & Head Girl Ritesh & Sandhiya delivered an inspiring speech to help the students imbibe a patriotic fervour. It was followed by an impressive dance programme and the singing of patriotic themes by the students of the school. The celebration concluded with the singing of Tagore’s composition, part of which is now our National Anthem.